jv16 PowerTools is the ultimate Windows Optimization, System Cleaning and Error Fixing Utility Suite. The program allows users to remove hidden traces of previously uninstalled software, to clean the Windows registry for optimal performance and stability, and to fix many registry-based problems with a single mouse click. 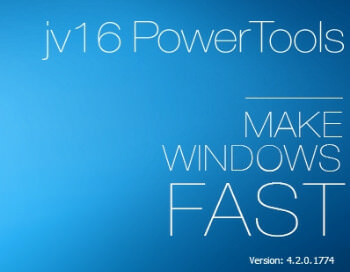 jv16 PowerTools optimizes, repairs, and maintains Windows based PCs making them running fast, safe, and free of problems. This suite containing 33 different tools. Each of these tools is carefully crafted with the experience of over 15 years of Windows utility and registry cleaning experience to form a solid foundation to give you a smoother and faster computer. The highly improved multilingual user interface allows the software to be used in all major languages, while automatic backup and safety features make the program very safe to use. jv16 PowerTools contains awesome performance and user interface improvements to offer its ever expanding user base an elevated level of Windows performance, security and control. The benchmark test covers 133 different software products claimed to make Windows PCs work faster. Clean and Fix my Computer. Finds and takes care of registry errors, unneeded registry junk, unneeded files, left-over temporary files, unneeded log files and much more. Everything in one go! New feature: Home screen feature in the main window shows you a summary of your computer’s health and performance. New tool: Startup Timer measures the time your computer takes to start up. New tool: Pictures AntiSpy allows you to remove privacy threatening metadata from your picture files. New tool: Windows AntiSpy allows you to disable the privacy threatening features of Windows. New tool: Easy Mass File Renamer offers an easier way to rename many files at the same time. New tool: Startup Details shows you the exact details of what processes were run during system startup and how much slower they are making your computer. New tool: Check For Vulnerable Software scans your computer to look for installed software and leftovers of software with known vulnerabilities. Improvement: Completely updated the System Health measurement. It gives you a more exact and detailed rating of your computer’s health. Improvement: Fully redesigned user interface for easier user experience and the new user interface also works better with different screen sizes. Improvement: Fully rebuilt Startup Optimizer allows you to easily speed up the Windows startup without removing any software. Improvement: Clean and Speedup My Computer tool contains dozens of improvements to allow a safer and more optimized user experience. Improvement: Major improvements in the Startup Manager. It can now also show detailed data of the resource usage at startup time per starting software. Improvement: Major improvements in the Software Uninstaller for more accurate listing of installed software. Improvement: The Initial Setup of the software now needs to be run only one time – instead of once every 15 days of the previous versions. And it also takes less time to run. Plus, hundreds of smaller improvements and bug fixes.